Is Justice Scalia serving the wrong master? My history undergraduates are surprised when I tell them that, in 1960, John F. Kennedy bore a nearly insurmountable burden: he was a Roman Catholic. There were many Americans who doubted that a Catholic could lead the nation. Would Kennedy consult the pope in matters of policy? If war loomed, would the American commander-in-chief delay action until he consulted the pontiff in Rome? Kennedy's victory over Richard Nixon was razor thin and his faith was one reason why. Kennedy's inaugural address is best known for its killer sound bite–"ask not what your country can do for you, but what you can do for your country"–but its most important lines were those with which he closed his speech: "With a good conscience our only sure reward, with history the final judge of our deeds, let us go forth to lead the land we love, asking His blessing and His help, but knowing that here on earth God's work must truly be our own." Kennedy's grand rhetorical flourish assuaged fears by subtly shifting the focus from Rome to home. Notice that conscience, history, and nation come before God in the speech, and that it ends with an emphasis on human deeds unmediated by popes or confessors. Kennedy's presidency put to rest a century's-old myth that Catholics were disloyal. It's hard to imagine anyone today raising fears of Vatican control of America, right? Not so fast. In Bruce Allen Murphy's new biography Scalia: A Court of One (reviewed in the June issue of The Atlantic), Murphy argues that what people feared about JFK in 1960 is true of Justice Anton Scalia in 2014. Scalia is more than the most rightwing of all Supreme Court justices–he's also one who takes more cues from the Vatican than from the Constitution in issues such as abortion rights, contraceptive policies, gay rights, gender equality, school prayer, and separation of church and state. Murphy notes that Scalia's views are nearly 100% in accord with those of Vatican, the glaring exception being that Scalia supports the death penalty. Were Scalia really a court of "one," there would be little cause for alarm. Alas, as we can readily observe, "faith" has become a conservative touchstone and a (nonexistent) "war on religion" a rallying cry. Scalia serves the intellectual-in-residence for at least three other justices. To pick just one potentially chilling example of Scalia's faith-driven positions that might hold sway, he has already signaled he will vote to grant Hobby Lobby petition for exemption from Affordable Care Act provisions guaranteeing contraceptive coverage in employee insurance plans. Hobby Lobby's conservative Christian owners claim paying for contraceptives violates their religious beliefs. If the private beliefs of Hobby Lobby's owners prevail over the public health rights of its employees, the floodgates will open for all manner of faith-based (or faith-faked) objections. As I have argued on numerous occasions, the very survival of American religious freedom demands separation of church/synagogue/mosque and state. American democracy is endangered when the religious beliefs of any one faith is privileged over other beliefs. This ought to be a clear violation of the First Amendment's opening line: "Congress shall make no law respecting an establishment of religion, or prohibiting the free exercise thereof…" There is not a word of the right of individuals to model national policy according to religious doctrine. They are free to "exercise" individual beliefs "freely," but the prohibition of "an establishment of religion" implies that public government and private belief must remain separate. The freedom to believe is not the same as the freedom to act. 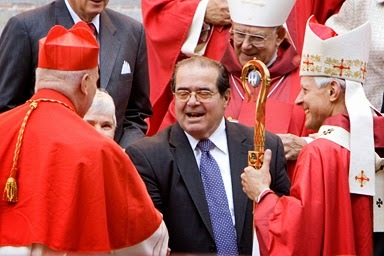 It's clear, though, that Scalia thinks the doctrines of Roman Catholicism supersede the U.S. Constitution. Maybe that sounds right and you agree that faith is paramount. How far do you want to take that? Should Muslims who carry out "honor killings" be exempt from murder laws? Should polygamy laws be repealed? Can satanic cults engage in human sacrifice? Some faiths sanction child marriage, are you okay with that? Naked Wiccans in the public square anyone? Can Quakers withhold taxes that go to the military? Is it okay to practice anti-Semitism in the name of religion? Race discrimination? Anton Scalia is a Catholic. I respect his right to practice his religion. I like Catholics and Pope Francis seems like a really good guy to me. But I'm not a Catholic and I don't want the Vatican's fingerprints on my country's laws. Scalia might be a brilliant man, but John Kennedy had it right. If Scalia wants to be a priest, take off the judicial robes and don a surplice. I’ve just come back from Cooperstown, New York, filled with hope. Not for my favorite baseball team—there isn’t much hope for them—but for the possibility that Americans can literally clean up their act. Cooperstown still has tree-lined streets where people walk, front porches on which they sit, and cafes in which they converse. You don't see self-important lap-topped hipsters ignoring the world; in Cooperstown you have to pay for you own damn WiFi. It's small, but it has a heartbeat–unlike American commuter 'burbs whose cookie-cutter sameness would flat-line an EEG. I anticipate your scorn. You wonder, “Did he drink a vat of Norman Rockwell-laced Kool-aid?” You’d probably protest that Cooperstown isn’t a real place— merely the domiciled analog to the Abner Doubleday myth, a baseball theme park fueled by tourist dollars and fattened by property taxes from fancy summer homes lining the head of Lake Otsego. Maybe you lump it with other unreal places: Hershey, Pennsylvania; Boulder, Colorado; or Orlando, Florida. You’re right, but only partially. Cooperstown’s main drag is a weird place, a hardball shrine with sacred offerings of balls, bats, and gloves. But beyond the surface luster is a small community whose per capita income is actually lower than the New York State average, and it’s surrounded by numerous other neat-as-a-pin farming communities that are not growing money trees on the back 40. There might be something even cornier at work: civic pride. Did you ever contemplate why American travelers to places such as Australia, Canada, Germany, New Zealand, Singapore, and Sweden come home stunned by the relative orderliness and cleanliness of those lands? It’s not that they’ve somehow solved social problems that plague the United States: poverty, institutionalized discrimination, addiction, untreated mental illnesses…. I could tick off distressing problems in each of those places. But one thing that is different is that each has a much more highly developed civic ideal, one that sees things in a we rather than a me perspective. You can see that in the streets, the lawns, the parks, and sidewalks. You can see it in how people dress—even the poor. I’m lucky. When I return from a place such as New Zealand or Cooperstown, I get to live in a town that’s the envy of many—a vibrant downtown, colleges, galleries, lots to do, climbing property values…. Yet the signs of civic indifference are all around me. I can show you the rusting grocery carts dumped into gullies by those enterprising enough to walk off with them but too damn lazy to return them, the decaying rental properties owned by modern-day robber barons, the perpetually drunk panhandlers, and the cafes with lines of sweat-panted laptop louts monopolizing tables designed for four by making a cup of herbal tea last all morning. I can take you past a home near me whose owner thinks that a collapsing fence, eye-high weeds, mildewed siding, broken windows, and junked cars are expressions of freedom. I’m not on a turn-back-the-clock Leave it to Beaver rant. I was born in the 1950s and it's only on television that all the lawns and towns were immaculate. There's a reason why Lady Bird Johnson was active in the Keep America Beautiful campaign in the mid-1960s, and there's really a reason why the Clean Air Act, Clean Water Act, and Environmental Protection Agency came into existence. My 50s/60s childhood was one in which people littered indiscriminately, factories dumped toxins into streams, cars belched exhaust into the air, and zoning laws were practically nonexistent. Americans have been pigs for a long time. But don’t tell me that poverty excuses our lack of personal or civic pride—that’s bleeding heart liberalism at its very worst. I wouldn’t deny for a second that our national priorities are seriously skewed—there’s always money for military toys and foreign adventurism, but not for infrastructure or the South Bronx. Nor am I suggesting that if we just tidied up a bit, our national problems would disappear. I’m saying it would be a good place to start. More pride in self and community might help Americans rediscover the “us” in USA—maybe enough to express their preferences politically. It's a lifestyle choice. Most of the residents of Cooperstown have opted out of squalor, even though the majority of them get by with a bit less money than other New Yorkers. And maybe that’s also a wake-up call for those of us fortunate enough to have assets, a reminder that without pride, materialism is as soul-deadening as poverty.